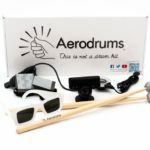 For when the Aerodrums founders, Richard and Yann, walked into the UK TV show, the investors offered £75,000 in return for a whoopin’ 30% of the company. And the Aerodrums founders declined. They guys behind Aerodrums are drummers like you & me. And they were fed up with not being able to have a drum set around – regardless of how big one’s apartment is or how tolerant one’s neighbours. Can Aerodrums do all that a real drum set can do? Can it do even more? And how does it feel like to drum when you don’t have to carry a 60-pound kit & spend half an hour setting it up? Is the camera included? Any alternatives? Difficult To “Set Them Up”? Matching Sound & Movements Well? You play Aerodrums using nothing but a pair of specifically designed sticks. And the sticks’ heads look so funny, because they are designed to tell the reflect light. And not just any light, but the one emitted by Aerodrums special lamp. 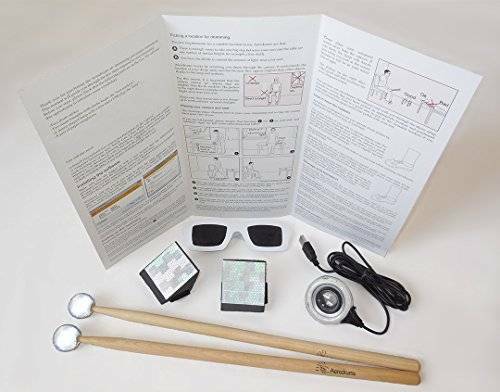 Finally, Aerodrums use the Playstation Eye camera to capture the differences in light reflection when you’re moving your sticks around as if playing a drum set. This is made possible by the Aerodrums “brain” which comes in the form of a software. This matches your movement with different cymbal, drum and bass drum sounds – & creates the sound of a drum kit as a whole. Oh and a propos bass drum sounds: they are not captured via your sticks of course. For that purpose, Aerodrums comes with two foot reflectors that will fit around any foot or footwear. As you notice: the software is not in the box. And that’s because we live in the 21st century – & can download it without wasting CD-ROM material (*environment thumbs up*). So to download Aerodrums’ brain, simply go here and enter your product key. You can then download either a Windows or Mac version of the software. Note that you cannot use the Aerodrums software on an iPhone (as long as it doesn’t run Windows or Mac). 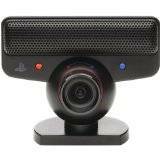 Can you use any alternative, such as a PS4 cam? 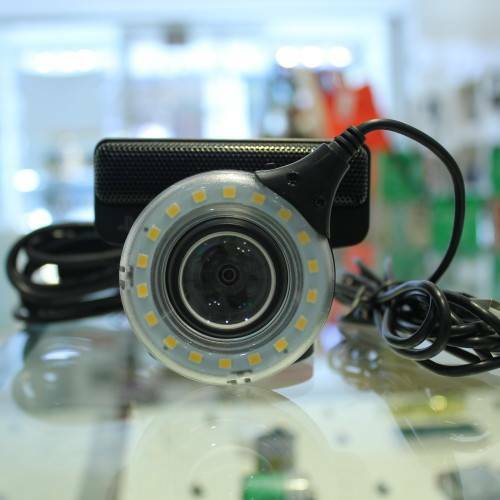 Or any other camera you have lying around? No! Aerodrums is designed to be used in conjunction with the PS Eye high speed camera. The good news is: you can add it to your Aerodrums cart in the “Frequently Bought Together” section (a bit below the product picture) – and it will be only a handful of dollars. If you can read, click a mouse and insert 2 cables into your USB ports – you’ll be fine! 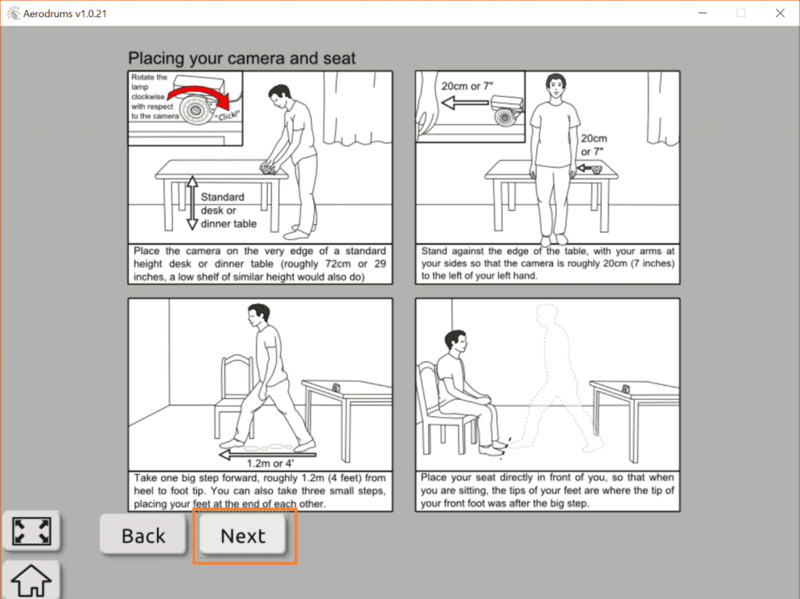 Next, Aerodrums visually shows you where to sit down. Before you do so, you might have to remove objects in your background that reflect light well – otherwise the camera won’t be accurate. Once setting and upon clicking “done”: ready to play. You can see below where I held my sticks at that moment (purple & pink dot). This is helpful at the beginning to become familiar with the position of the various drums and cymbals. To my mind, this is as straightforward as it can be. If you follow the instructions, Aerodrums will be up and running in 5 minutes. 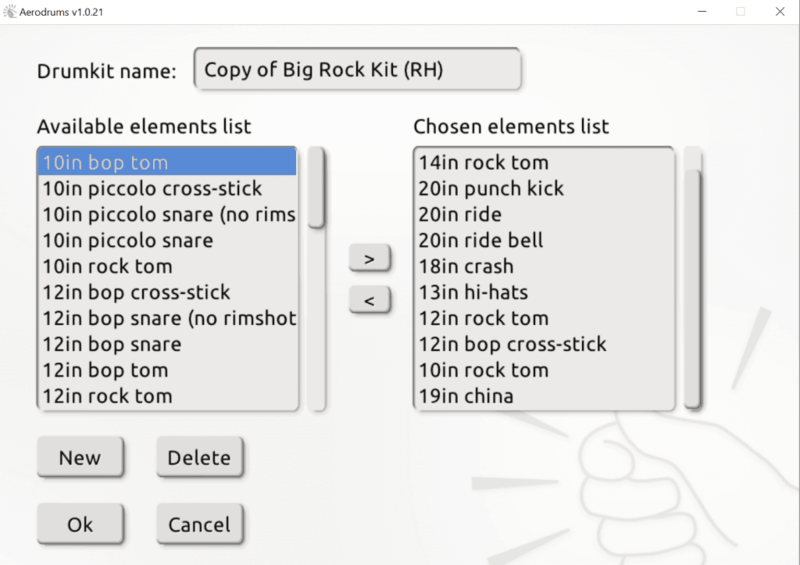 I think that’s a considerable advantage for drum beginners who’d otherwise have to spend an hour or longer on setting up their first physical drum kit. Plug a pair of quality drumming headphones into your computer. I’ve reviewed the best budget models here. Connect your computer to an amplifier via a cable like this. Depending on the jack of your amplifier, you might need such an adapter too. Admittedly, 7 preset kits is not much when compared to a good electronic drum kit. 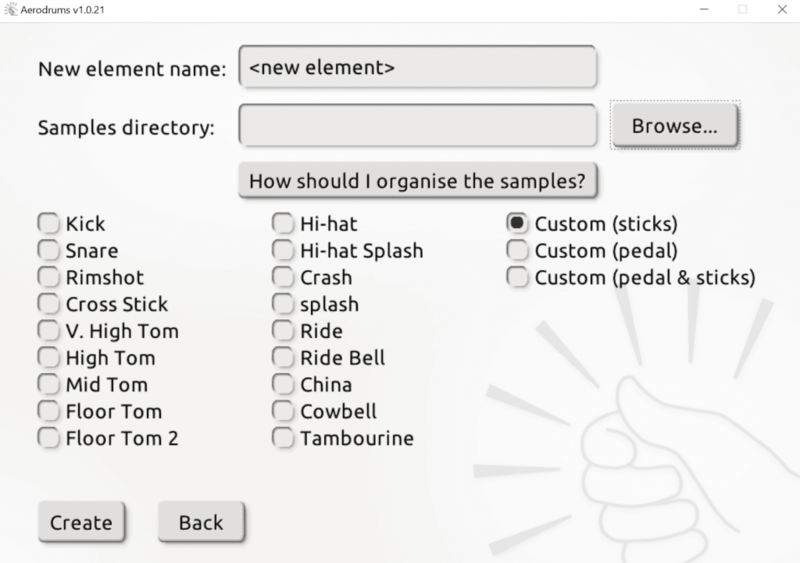 But, you can create as many new kits as you want and FREELY choose all the drum / percussion / cymbal sounds used in them. Can Aerodrums also be used with as a MIDI trigger? Do Aerodrums accommodate left-handed playing? As you can see below: Yep! Generally, I’m very impressed with how accurately Aerodrums has been able to match my movements to the intended drum sounds. I had to take 10 minutes at the beginning to find out where exactly the individual drums were placed. But it’s acutally a pretty cool feeling to hear the accustomed drum sound – while placing strokes in nothing but thin air. And the visualization of the drum kit and the sticks & foot pieces on the computer screen helped me a lot to find my way around the kit. For when playing standard grooves (which means hitting the HiHat continuously) I would produce a cross-stick snare sound every once in a while. For me, the two were simply positioned too close together. 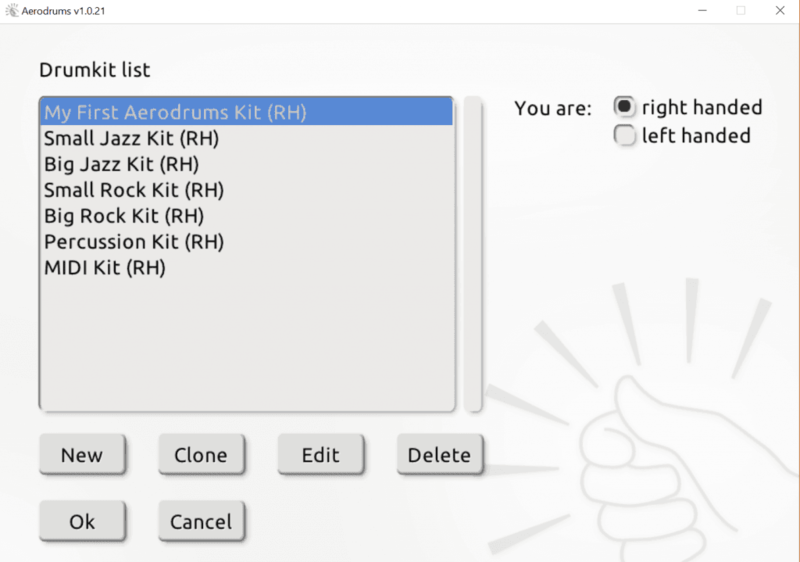 Luckily, you can also set up the kits according to your personal preference. To that end, Aerodrums asks you (upon completing setup) to “place a firm snare hit” somwhere in the air. And whereever you do hit, the software will position your snare drum. With that the matching worked just fine. There was no confusion between any drums whatsoever any more. I’m really impressed by how well Aerodrums can distinguish between normal Snare strokes and intended rim shots even at very high speed. I’m not entirely sure how the software does it, but as soon as I begin a snare stroke higher up in the air (thus also giving it more speed), the rim shot is recognized. Finally, there’s one thing that you cannot do playing Aerodrums: chocking the China, Crash or Ride cymbal. I asked the queston this way, because that’s literally what many people have asked me. I suppose they mean: does playing Aeordrums feel like playing on an acoustic or electronic drum kit? They answer is no! And how could it? After all, there is no surface that you’re hitting. It’s an air drumming system. At the same time, that doesn’t imply ANYTHING negative. It just means playing Aerodrums feels DIFFERENT. Since you only have the Aerodrums sticks and you don’t actually hit a drum head, rebound will be different. If you think there would be none at all, think again. For when you let the drum stick fall (as you were hitting), it will inevitably hit the fleshy part of your palm at some point. And from there it will bounce back. Not as hard as from a wooden surface of course. But bounce back it will. And this is your rebound. This is all good in theory, but I suggest you get a pair of sticks (or something similar such as a large wooden spoon) – and try it out for yourself. I’m sure you’ll feel what I mean. [embedyt] http://www.youtube.com/watch?v=iF8296Aai9k[/embedyt] As you can see at about 2:25, you can also do double stroke rolls with the rebound Aerodrums provides. So there you have my Aerodrums review. If you have tried Aerodrums yourself, please tell me what you think about it in the comments. I’m always interested in your story – and open to any objections to what I’ve said here. I’m also more than happy to answer your questions in the comments below! Aerodrums has been the only sophisticated virtual drum kit for about 4 years. As such it marks the second stage in the evolution of mobile electronic drum kits (the first one being electric drum pads). However, Aerodrums meanwhile has gotten some competition. It’s called Freedrum and I’ve compared Aerodrums to Freedrum here. Let me know what you think about Aerodrums in the comments. Or ask me a question. Or yell at me if you found this review to be crap. I’ll get back to you in any case! This Aerodrums review was helpful to you? You’ve decided to buy an Aerodrums? Well then please consider going through the links on this site. This would reward me for the care & effort I put into these reviews with a small commission on your purchase. This comes at ABSOLUTELY no extra cost for you. But it makes your visit at Kickstart Your Drumming a win for both of us (I hope it was one for you!). If you’re in any way unsure about my REVIEW ETHICS, see my affiliate disclosure. You most certainly can. Here’s a tutorial on how to record Aerodrums into a DAW. I play keys and am learning bass. I fancy a go at drums, but my physical condition prevents me. I have rheumatoid arthritis. Both hips replaced (which are fine) and my right knee has been replaced (not fine). My right knee will not bend. It is fixed straight. I am also left handed. As my left foot would be used for the bass drum and my right foot used the the high hat, as my right leg would be extended fully out, would aerodrums still work for me? 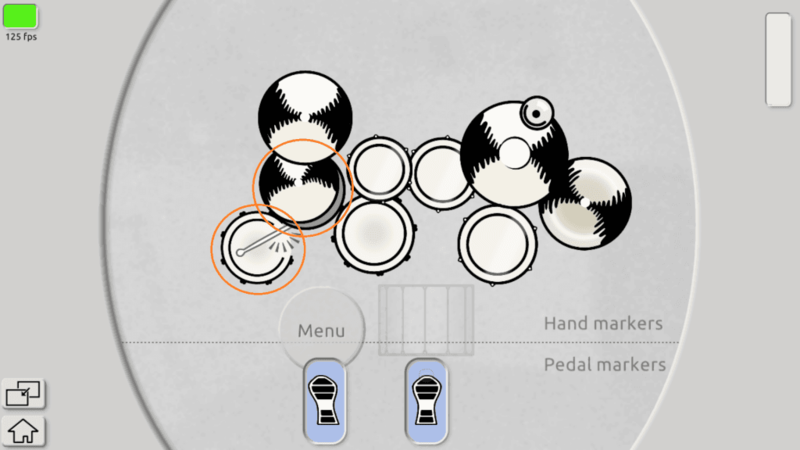 Aerodrums should work as there is a custom mode in which you can arrange the pieces of the set to wherever you’d like them. Only thing is: as you play the HiHat with both hand and foot, you have to find a place that is comfortable to both your foot and you arm (which wouldn’t usually be fully stretched out when hitting the HiHat – not because it’s a technical hinderance but because it’s more strenuous). thanks for all the useful info, it got me convinced i need one of these! i have one question though. i am not a drummer but a guitarist, only drumming for fun and for some reason – though i’ve always been fully right-handed – my snare-hand is my right hand and my hi hat-hand is my left hand (on right-handed kits of course) so by default my hands are not crossed like all drummer’s. Can this be a problem, how would the kit know that i am mixing up my hands? for some reason i cannot play otherwise, i tried but failed. 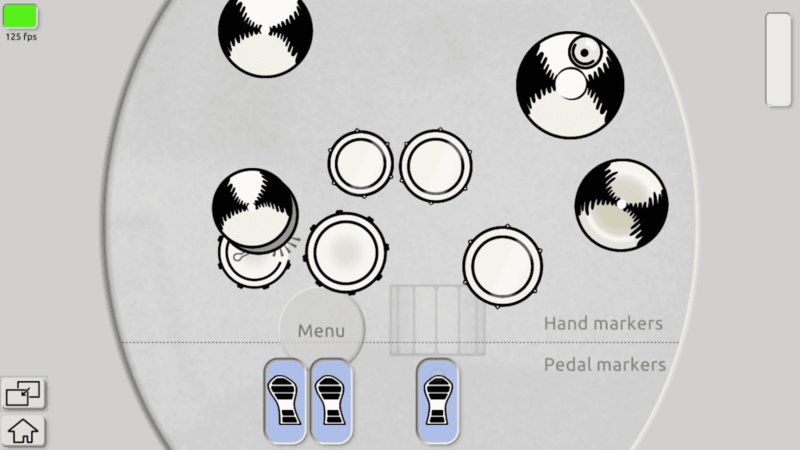 i wold prefer the hi hat to stay on my left, is that possible without using the left-handed setting? Cool you like Aerodrums. I find the loads of fun too! Playing open-handed is not a problem at all with Aerodrums, since the camera only pays attention to where the tip of your stick is. So as long as you hit, say, the (imaginary) hihat, it doesn’t matter whether your stick extends to there from your left of your right hand (or from your foot or whatnot…). I haven’t had latency issue so far. There should be an indicator at the top left in Aerodrums – if it’s green, latency should be good from Aerdordums perspective. If you use speakers, place them as close to you as possible (2m from your seat will add about 6 milliseconds of perceived latency. If you use the Aerodrums sound (the default), make sure to minimize latency in the Aerodrums “Latency” menu. If you drum through a sampler via MIDI, set the audio settings of your sampler’s host to minimize latency. Hi, great review thank you, i cannot find a link for what i think you called the hands and foots pedal as i would like to try using a pedal, can you possibly supply some links?? Thanks in advance. I’m not sure what you refer to as the hand pedals – but the link for the foot pedal is here. On the video and sounds like you are saying, hands and foots, not Hansenfutz. Thankyou for the link and the very quick reply. Sorry I misunderstood. However, I still don’t quite know what you’re asking. Can you clarify again, please? Sorry for being so slow to understand here. 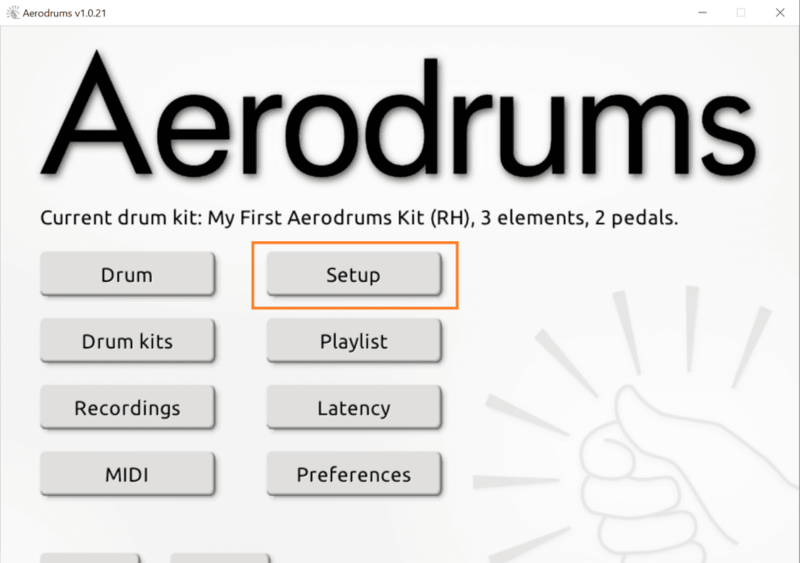 I do know that Aerodrums works with most major drum sampler software such as EZ Drummer and the likes, but I genuinely don’t know if that means it will work for the Roland drum tutor too. So I fear you’d have to inquire directly with Aerodrums, sorry. If you do though, please let me know the answer. I’m interested too! Unfortunately, that doesn’t work. 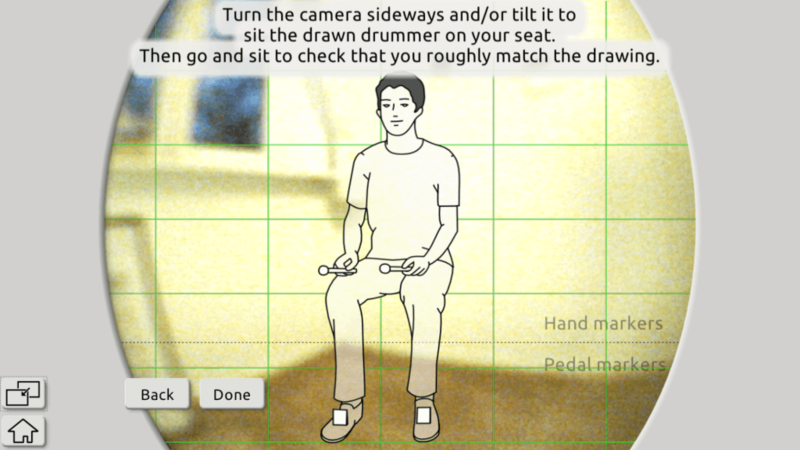 A virtual drum kit that works on iPads is this. First of all, your review is very helpful and contains a lot of useful information for someone considering buying one. I just have one question, can I set it up to have two kick pedals and still have the hi hat pedal? 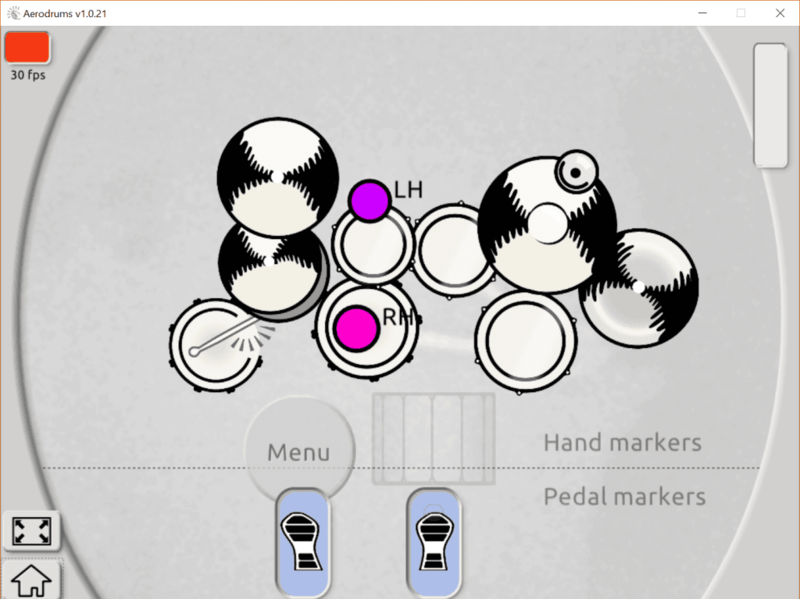 Yes, since you can create your own kits with Aerodrums or add additional drums / cymbals / pedals to exisiting kits, you can have a double bass pedal along with a Hi Hat. Hi, thank you 4 the review very helpful, short question, what is ur experience with beginners? Actually, I wouldn’t recommend Aerodrums for a complete beginner who’s serious about learning the drums well – because Aerodrums will give you no rebound (barring you from learning some techniques) as well as give you a hard time programming the standard drum setup into your muscle memory. This is all fine for drummers who know that stuff already, but I don’t think a beginner would benefit. So if you are a complete beginner, I recommend you check out this post.